When your parents confirm or adds student data they can link their children with the appropriate teacher. You as the administrator can also manage the class rosters in the system. Go to People / Rosters. First find the the teacher. Only teachers that have the "is teacher" checkbox checked will be displayed. Click the Assign Students button. On the next page select the grade of the students you wish to assign. Note that students from any grade can be assigned to any teacher. 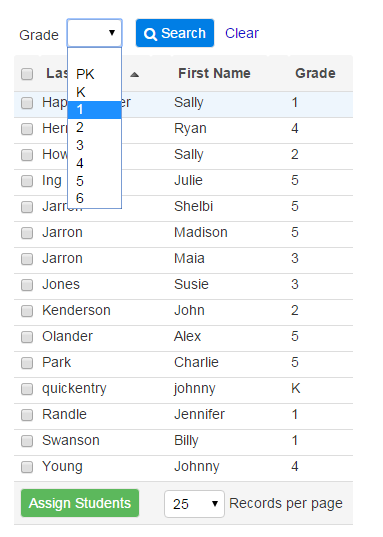 Check the students you want to assign and then click the Assign Students button in the bottom of the list. Once a student is assigned to a teacher they will no longer appear on the list. Once you've selected the Assign Students button for the teacher, you'll see the following page to select from a specific grade. Only unassigned students will be displayed.